Dumpling. One simple word holds so much meaning and incites vivid thoughts of gastronomic pleasure. If I had to pick a single favorite food in the universe (yes, the UNIVERSE--not just planet Earth), it would be dumplings. 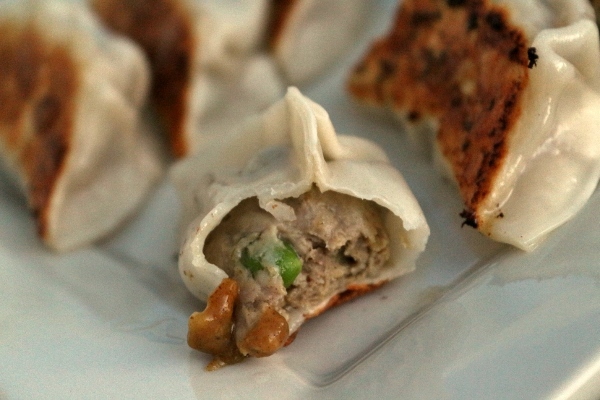 Not simply Asian dumplings, but really the entire span of dumplings from all global regions. Dough wrapped around delicious filling is a universally loved treasure, and I've cooked my share of dumplings from all cultures over the years. Let's take a trip down memory lane. I suggest placing a napkin directly under your chin to catch excessive drool. 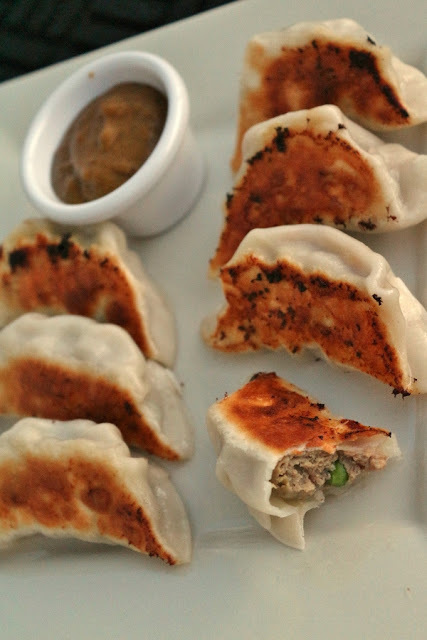 I have posted TONS of recipes for dumplings on Mission: Food over the years. Making dumplings is one of my favorite pastimes, such a gratifying experience. I tend to make most of them completely from scratch (that includes the dough) and suggest all dumpling-lovers attempt to do so at least once. The results are incomparable. A couple months ago, New York City hosted its first ever Dumpling Festival on National Dumpling Day. It was a swoon-worthy event, and I was lucky enough to be one of the bloggers tasked with writing about it. 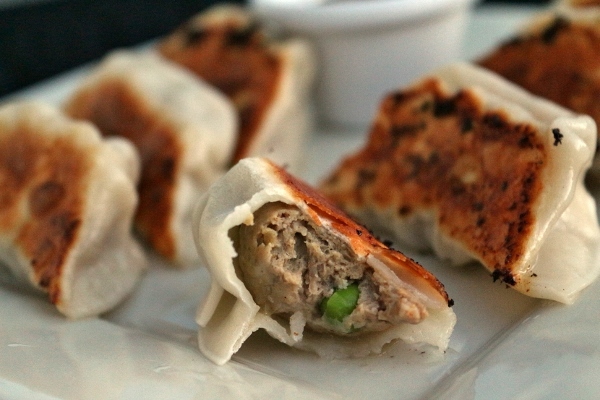 In honor of the occasion, I shared a post highlighting my Top 10 Favorite Dumplings that I have previously shared on my blog. I also have an ongoing post, which I update periodically, with Chinese and Chinese-inspired recipes perfect for Chinese New Year celebrations. I highly suggest checking out these links if you're interested in some of the dumpling and/or Chinese recipes I've previously shared. 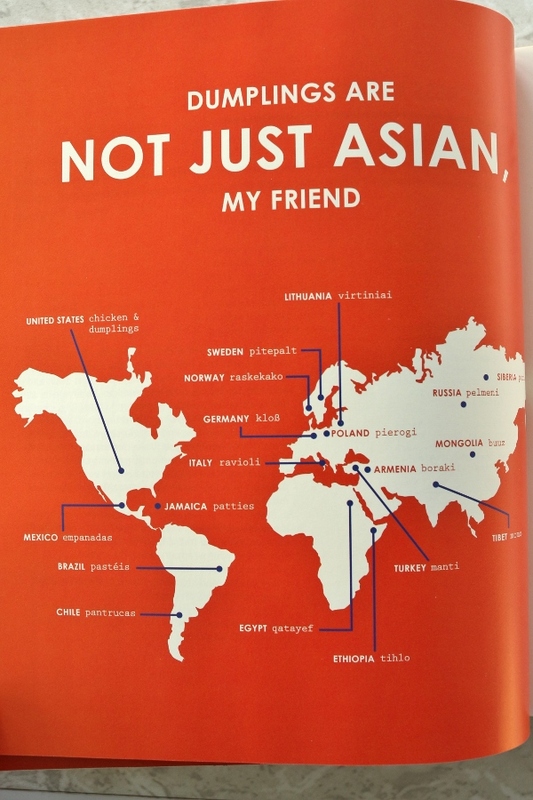 Some International dumpling love--I was really excited to see Armenia represented on this map of dumplings from around the world! 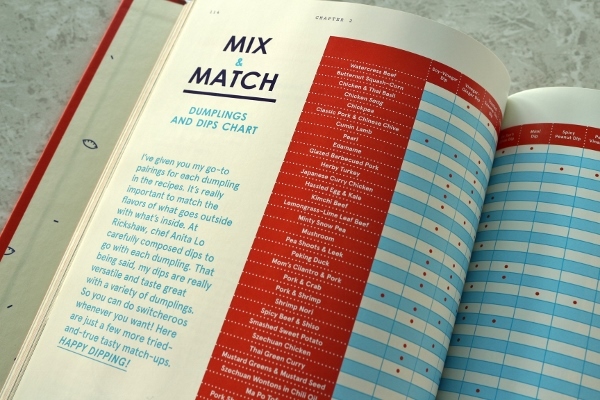 Today, we're going to open a new chapter in dumpling-making by taking a look at a recently released cookbook authored by Kenny Lao, the founder and owner of New York City's former dumpling haven, Rickshaw Dumplings. Hey There, Dumpling! contains many of the famed dumplings created by head chef Anita Lo, along with several of Lao's family favorites. There are also chapters devoted to Buns & Noodles, Salads & Sides, Finger Foods & Snacks, Drinks, and Desserts, perfect to help round out any dumpling meal. I could barely contain my excitement upon receiving this gorgeous cookbook from the publisher. They also sent me some Hey There, Dumpling! chopsticks. 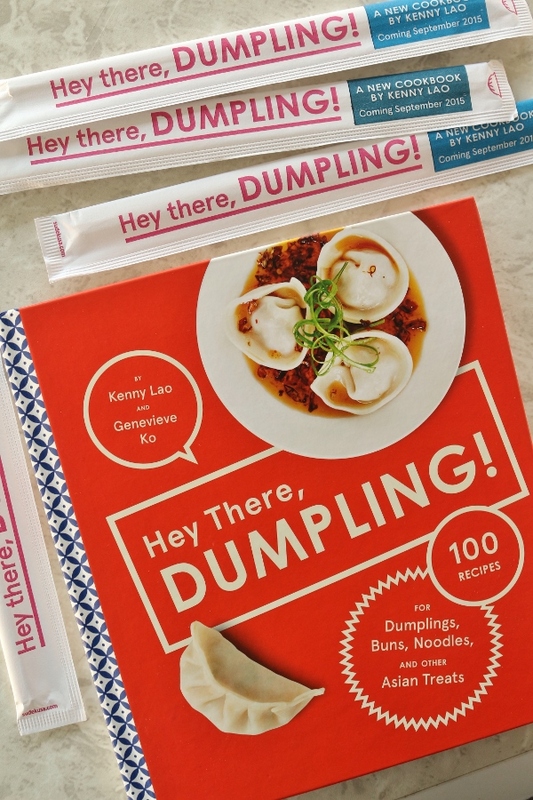 What a fun, creative and useful marketing tool to get the word out for this awesome dumpling book. The book is an incredibly charming look at dumplings, complete with fun and playful illustrations on dumpling folds, and more. 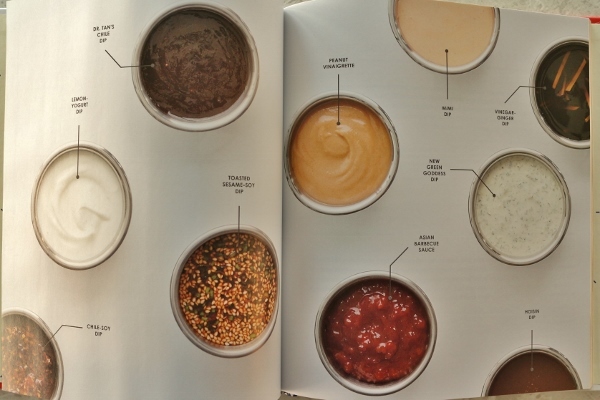 One of my favorite features in the book is a mix and match dumplings and dips chart that helps pair every single dumpling recipe in the book with a variety of dipping sauce options. It's like a dumpling dream! 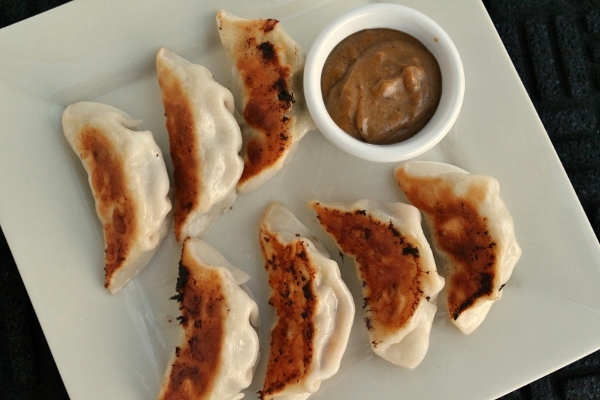 Nearly all of Lao's dumpling recipes utilize store-bought wrappers, with the exception of the soup dumplings which absolutely must be made with homemade dough. I'm a homemade dough kind of girl, and take particular pride in my attention to detail when making dumplings from scratch, but I do appreciate the convenience factor of using store-bought wrappers, and considering the fact that many actual Asian people use this shortcut, I'm willing to make some concessions and be open-minded to the idea. Call me a snob, but I just love making things from scratch whenever I can! 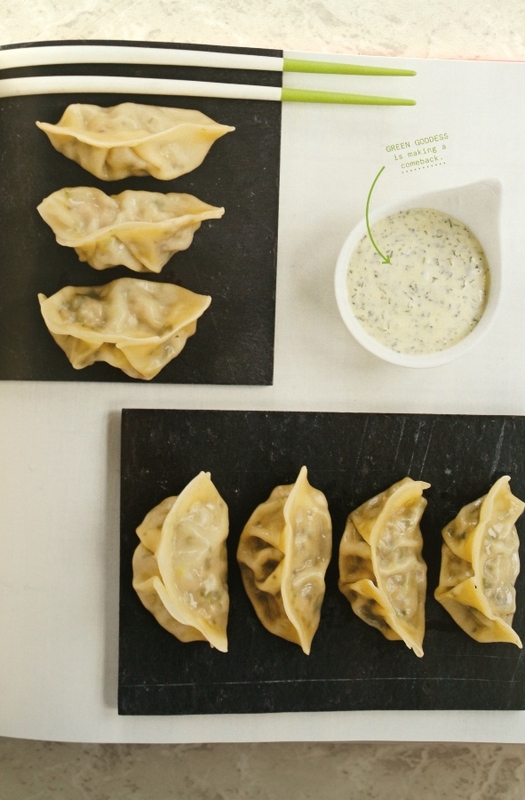 I can see how hosting a dumpling making party would be especially easy and less daunting by using store-bought wrappers, especially for newbies, so I say go for it. 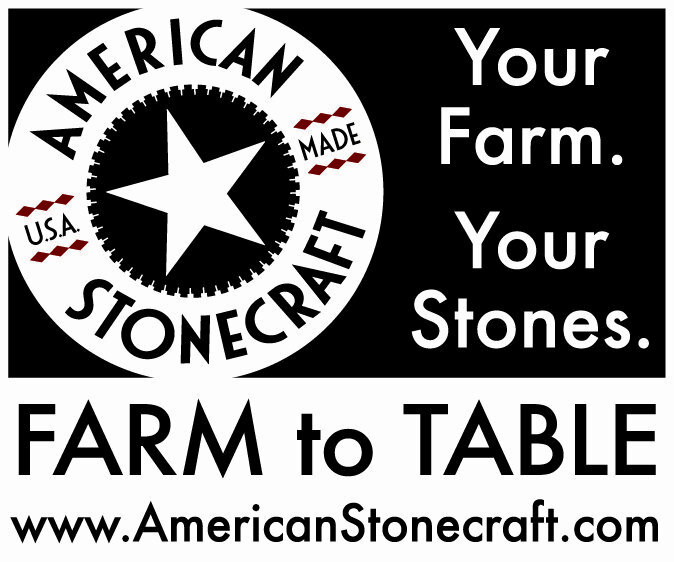 It really is remarkably faster, and a great way to get your feet wet in your dumpling-making adventures. There are so many recipes in this book that stand out. I'm the proud owner of three other stellar cookbooks completely devoted to dumplings and dim sum (not to mention other Asian cookbooks containing dumpling recipes), but I'm proud to say that Hey There, Dumpling! easily holds its own next to the other books. It contains tips and information that are new to me even after immersing myself into dumpling making for years now. Not only that, but there are several truly unique dumpling recipes within that make this book completely worthwhile even with an arsenal of dumpling cookbooks on my bookshelf. Fan favorites like Rickshaw Dumplings popular Chicken & Thai Basil Dumplings with Spicy Peanut Dip are included in the book, along with other standouts such as Japanese Curry Chicken Dumplings, Peking Duck Dumplings, Chicken Saag Dumplings, Herby Turkey Dumplings, and Hot & Sour Soup Dumplings, just to name a few. 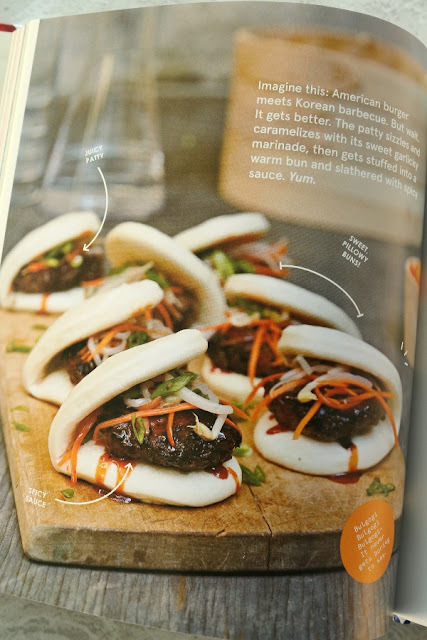 Awesome bun recipes include Bulgogi Beef Sliders and Sloppy Zhou Chicken Curry Buns, a creative play on Sloppy Joes. 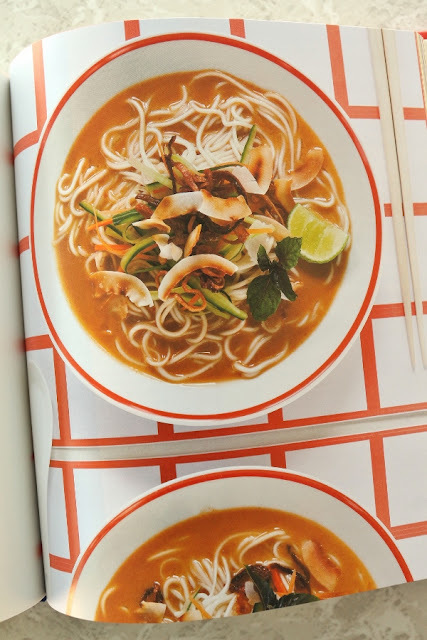 Meanwhile the Peanut Sate Noodle Soup with Crispy Shallots is a mouthwatering ode to peanut sauce, and the Chocolate Soup Dumplings are an unequivocally decadent finale to the dumpling-noshing experience. As usual, I struggled to select which recipe to try first. After much deliberation, I decided to make the Japanese Curry Chicken Dumplings. 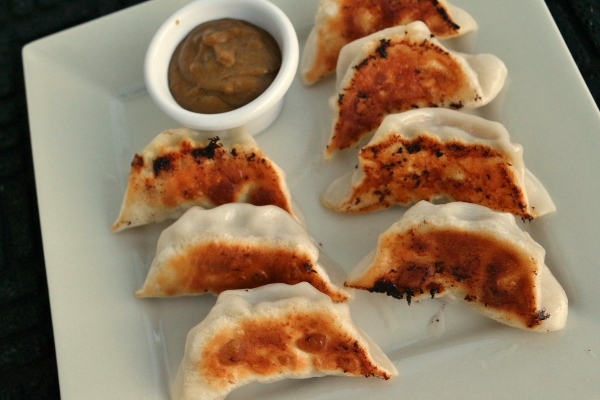 I love dumplings and I love Japanese curry, so the combination is right up my alley. You begin by making a homemade Japanese curry sauce, which is quite simple and starts with a roux enhanced with curry powder and garam masala. Many recipes for Japanese curry tend to begin with store-bought Japanese curry cubes, so it's nice to see this sauce made from scratch. The recipe doesn't include any salt in the sauce, but I think a bit of salt can help bring out the flavor here, and would be welcome. 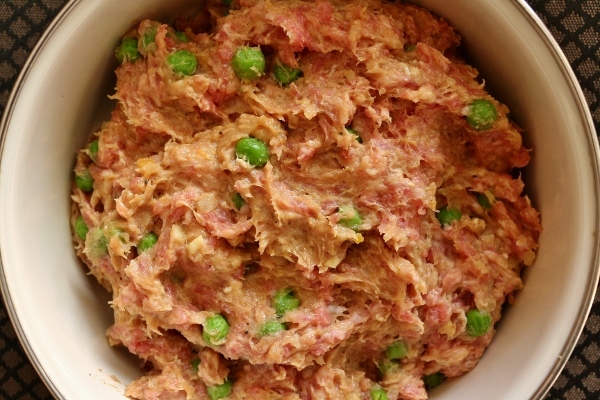 A portion of the sauce is reserved for dipping, while the remainder is combined with ground pork and chicken, along with peas, onions, and ginger to create the filling. Please keep in mind that both curry powder and garam masala are technically spice blends and can differ from brand to brand, and can even be made from scratch in your own kitchen. This can certainly cause variances in the curry sauce depending on the particular curry powder and garam masala you use. Lao utilizes a slightly unique cooking method for pan-frying his dumplings. He adds some oil to a cold pan, then arranges the dumplings and adds some water before covering and heating over medium heat. This is a gentler approach to cooking the dumplings and doesn't have the same splattering effect you may get when pan-frying dumplings the traditional way. The technique worked, but the amount of water he uses (3 tablespoons) was not nearly enough in my opinion to create enough steam to cook the dumplings all the way through. I added a bit more water partway through. To be honest, I would probably still use my tried-and-true cooking method in the future, but I did find this to be another successful approach, once I upped the amount of water by several more tablespoons. The resulting dumplings are as good as I expected. I didn't use particularly fatty pork (just the standard ground pork I always use) or dark-meat ground chicken (just regular ground chicken), and the filling wasn't quite as juicy as some of the other dumplings I've made in the past, but it wasn't dry either. I think the curry flavor was fantastic, and especially in conjunction with the extra curry sauce for dipping, it's really a super flavorful dumpling. Add a bit of brightness from the peas, and these dumplings really do encompass the best of Japanese curry chicken in dumpling form. If you love dumplings as much as I do, I encourage you to check out Hey There, Dumpling! 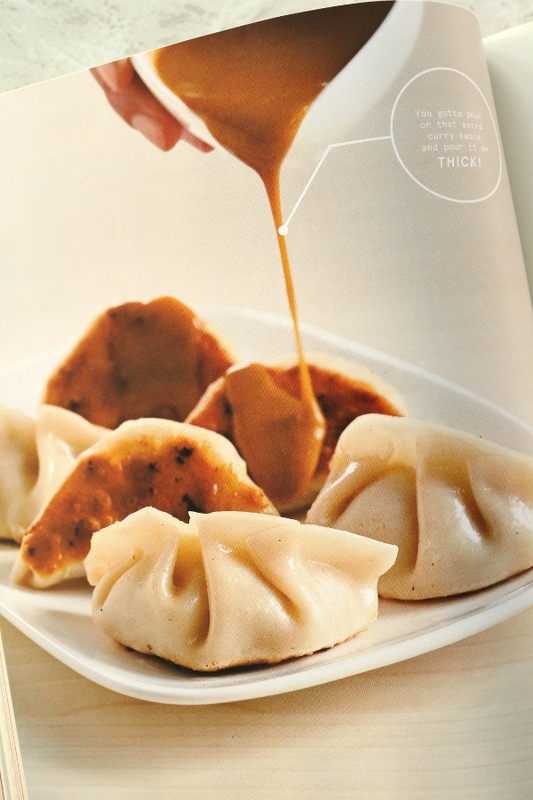 If you love making dumplings, you can never have too many great dumpling cookbooks, and this one's high on my list. 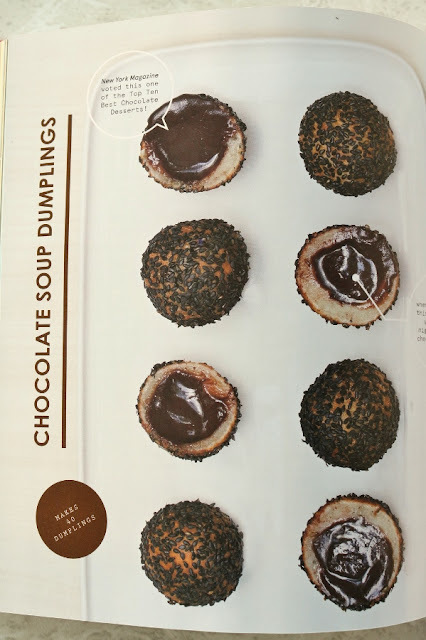 It would also make a great gift for dumpling-loving friends and family this holiday season. I personally look forward to exploring more of the creative dumpling recipes within. Happy cooking! Melt the butter in a medium saucepan over medium-low heat. Add the flour and cook, stirring continuously, until browned and the raw smell dissipates, about 2 minutes. Add the curry powder, garam masala, ketchup, Worcestershire sauce, and pepper (you may also want to add a little salt here). Cook, stirring continuously, for 1 minute. Continue stirring while adding 1 cup water. Bring to a boil and simmer, stirring frequently, until the sauce has thickened. Transfer 1/2 cup to a large bowl and let cool to room temperature. Reserve the remaining sauce in a separate bowl for serving. After the sauce in the bowl has cooled, add the pork, chicken, peas, onion, ginger, and salt. Use your hands to work all the ingredients together until well-mixed. It's best to use your hands because you can get everything incorporated into the meat without making the pieces of meat too small. If you have time, cover and refrigerate the filling until nice and cold, up to 2 days. the filling will be easier to spoon into your wrappers when it's chilled. Take out five wrappers and cover the rest with a damp dowel. Lay out the five wrappers like ducks in a row. Wet 1/2 inch of the rim of each wrapper. Scoop a fat teaspoon of filling into the center of each wrapper, shaping it elongated like a football to make it easier to fold. Fold the wrapper in half like a taco and pinch the edges at the top center. Continue folding the dumpling using your preferred folding method (simply press the edges together or pleat to create another shape--I used the "Buddah's Belly" fold from the book). 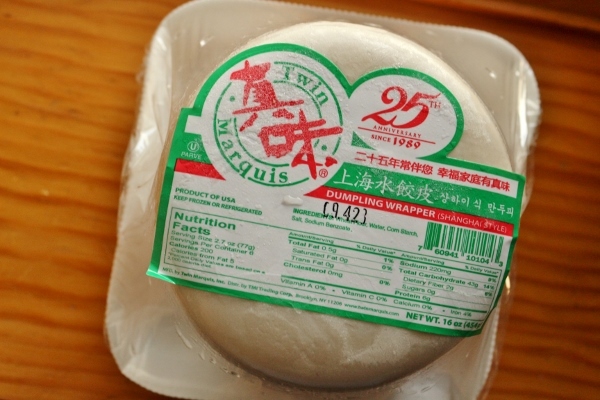 At this point, the dumplings can either be cooked immediately, covered and refrigerated for up to a couple hours, or frozen. 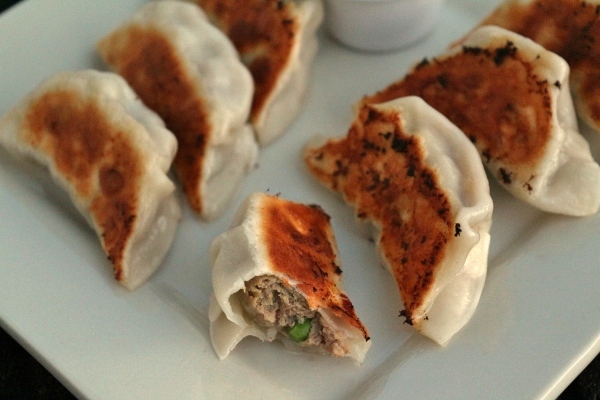 When you're ready to cook your dumplings, choose a large nonstick skillet with a lid. Coat the bottom of the pan with oil. Start arranging the dumplings in super-tight concentric circles. Add 3 tablespoons water to the pan (I suggest a bit more than this, especially if you are cooking a large batch at once), set over medium heat, and cover. 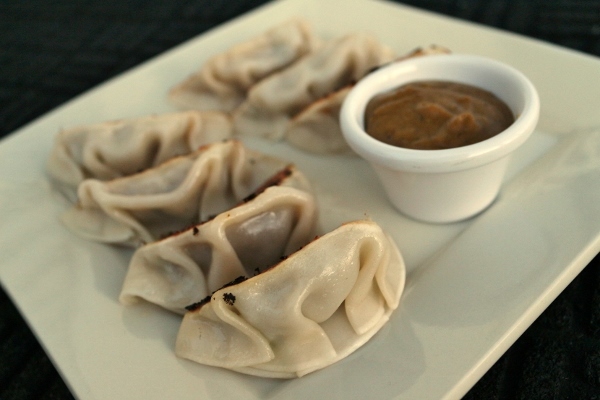 Let the dumplings cook, rotating the pan every once in a while to promote even cooking. When the bubbling sound switches to a crackle, lift the lid to peek and see if the pan is dry. This step takes about 7 minutes with fresh dumplings and about 10 minutes with frozen ones (mine took longer than this--I usually use another, more traditional method to pan-fry; you can find it here if you're interested). You may need to continue to cook the dumplings for a few more moments to ensure they are evenly browned once the water has evaporated. 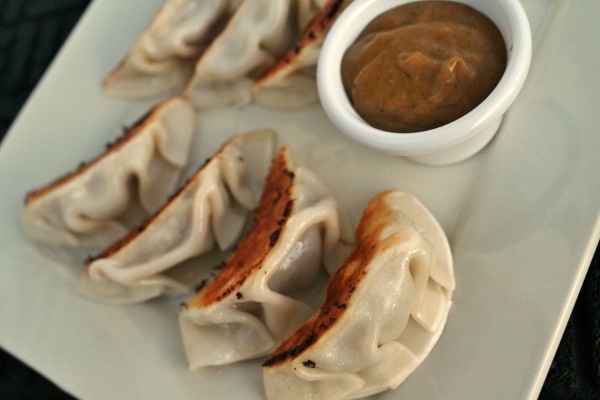 Serve the dumplings with the reserved dipping sauce, reheating if necessary.